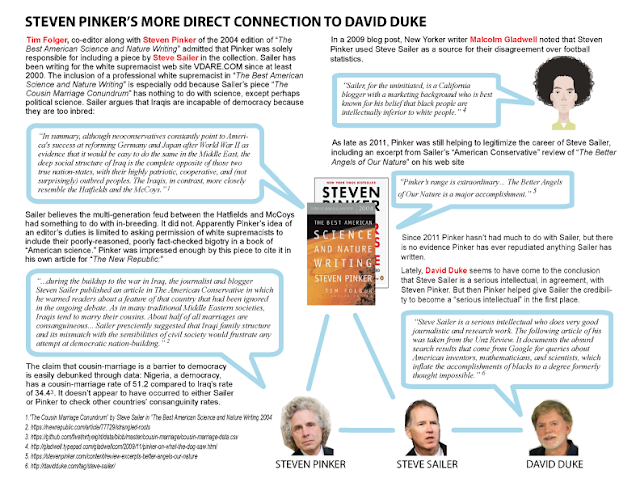 Heavens to Mergatroyd: Is it fair of me to link Steven Pinker to David Duke? Is it fair of me to link Steven Pinker to David Duke? Go a click in one direction and the group is enhanced by intellectuals with tony affiliations like Steven Pinker at Harvard. But go a click in another and you’ll find alt-right figures like Stefan Molyneux and Milo Yiannopoulos and conspiracy theorists like Mike Cernovich (the #PizzaGate huckster) and Alex Jones (the Sandy Hook shooting denier). As I demonstrated in my diagram Steven Pinker's Rightwing, Alt-Right and Hereditarian Connections - a sort of Pinker-centric illustration of the Intellectual Dark Web published a month before Weiss's article - Pinker has connections to Molyneux and Alex Jones (Infowars), thanks primarily to his promotion of and admiration for Quillette, a web site founded by Claire Lehmann, contributor (along with Mike Cernovich who does not appear in my diagram) to Canada's far-right Rebel Media. 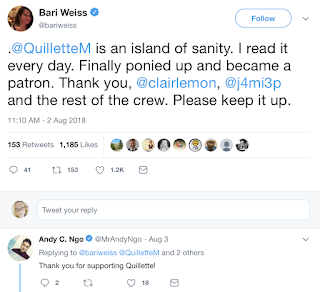 Bari Weiss also admires Quillette. identified as a "free speech grifter" in this excellent GQ article. I have been accused by Pinker fans of smearing Pinker in my diagram through guilt-by-association. My diagram is a quick and handy guide, a picture being worth a thousand words and all, but it isn't the whole story. I included a text-based explanation with the diagram, justifying the Pinker connections, but Pinker's fans are inclined to be intellectually slothful and shallow - much like Pinker himself - and they just can't be bothered to read what I have written, much less come up with actual arguments. In my original Pinker diagram there are four degrees of separation in the shortest route between Pinker and white supremacist David Duke, currently being portrayed by Topher Grace in Spike Lee's new movie BlackKKlansman, as in: Pinker to Quillette to (three Quillette authors) to Stefan Molyneux to David Duke. But I explained in the footnote of my diagram, I don't include all the inter-connections for the sake of clarity. But this time, I am presenting the most direct connection between Pinker and Duke. And this time I included the text explanations so that even the laziest Pinker fan cannot miss them. You can click the image to see the PDF version. I think it's likely that Steven Pinker is, on a personal level, even more right-leaning than his public persona would indicate. I think he reigns in his more extreme opinions (and so do some of his fans) because, I believe, Pinker is foremost a careerist. Which is why we see, for example, Pinker bragging about his meeting Justin Trudeau even though many members of the Intellectual Dark Web hate Trudeau, especially Pinker's good buddy Claire Lehmann. Their hatred of Trudeau, a proud feminist, is what you would expect from people who have a seething, bitter hatred towards feminists. Lehmann herself not only hates feminists but is a straight up misogynist. So is her fellow Rebel Media contributor Gavin McInnes. 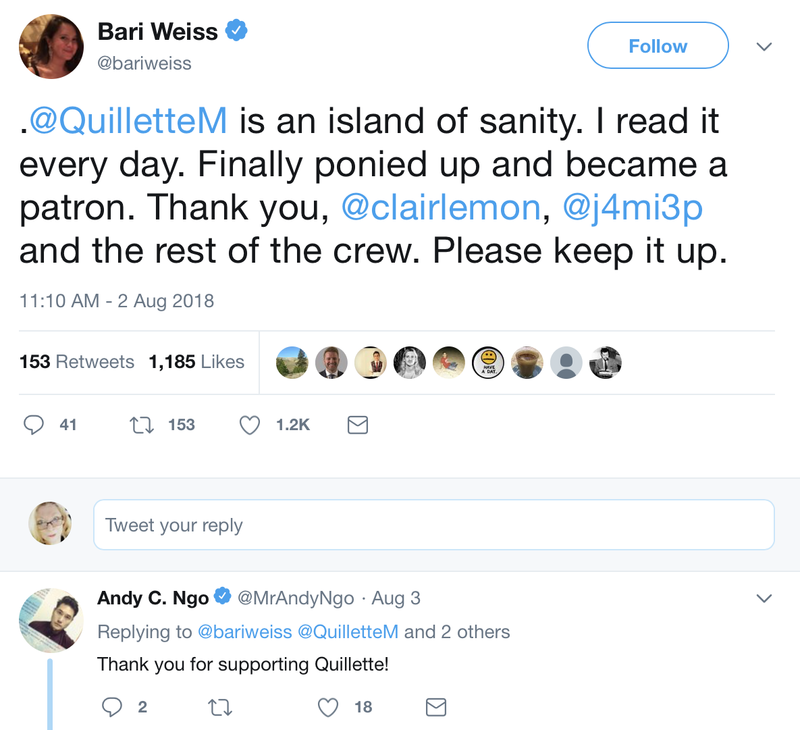 Apparently the Quillette gang has begun podcasting. All the more reason I need to start a podcast examining the "Intellectual Dark Web." What hath Robin DiAngelo wrought?